According to a report from Industry Canada, venture capital fundraising activity saw a small year-to-year decline for the third quarter of 2012, with $363 million raised by 88 companies. 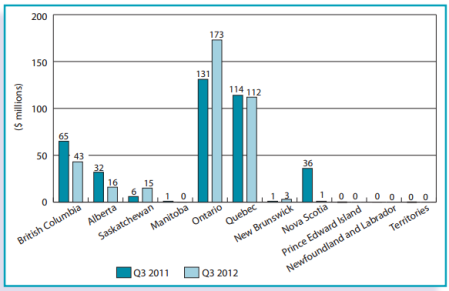 That’s a decline of six per cent over the $386 million raised by 129 companies in Q3 of 2011. However, despite the decline, according to the report Canadian VC activity in 2012 is still on pace to match 2011 levels, thanks to a strong Q2, which saw 444 million raised. Some 41 fewer deals were closed in Q3, but with total financing falling by just $21 million, the deals that did get done were larger – the average deal size for the quarter reached $4.1 million. This was helped along by several larger deals that closed in the period, including $80 million for Kitchener, Ont.-based Desire2Learn Inc., Canada’s largest VC deal in over five years. Seed and start-up companies did better in Q3 with 33 deals worth $97 million, a significant improvement over the $39 million raised by 41 companies in the same period a year earlier. Later stage companies still led the way though, raising $231 million. When it comes to deals by geography, Ontario and Quebec lead the way, closing 30 and 27 deals respectively. British Columbia was next with 14, while all other provinces were in single digits or saw no deals closed. Finally, the technology sector continues to dominate the VC scene, with ICT firms attracting 57 per cent of all funding in the quarter. Meanwhile, StartupCFO blogger Mark MacLeod shares an interesting theory on the common refrain that there just isn’t enough capital available in Canada: maybe there is, but there aren’t enough of the sort of deals VCs are looking for.